Overview of the track in Mario Kart: Double Dash!! Mushroom Bridge is a racecourse from the Mario Kart series. Its first appearance is in Mario Kart: Double Dash!! as the first racecourse of the Flower Cup. Later, the course makes a reappearance in Mario Kart DS as the final track of the Leaf Cup. 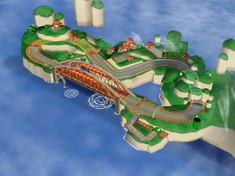 The course takes place on a one-way highway near the coast, and the racers have to share the track with slower vehicles that almost always damage the player when struck. The highway runs over the Mushroom Bridge that gives the course its name. Mushroom City and Princess Peach's Castle can be seen in the background near the beginning of the course. This course shares its music with Mushroom City. The track starts out just before the first left-hand curve. Players can take a path leading off of the main course to the right shortly after the starting line, which goes down a slope to a Warp Pipe leading to a Double Item Box as it blasts the players back onto the track. The course then heads into a curving tunnel lit up with green lights. The players catch up to the cars they share the track with in the tunnel, and after clearing the curve, they encounter three Item Boxes. After leaving the tunnel, the track curves between the coast and some hills topped with mushroom-like huts. A path leads over the hill, but if the players do not have a speed-boosting Mushroom or Star, their kart is slowed down substantially by the dirt. Another alternate route exists in this section of track: there is a sidewalk on the left hand side of the track, and while its usually separated from the road by fencing, there are open sections granting the players access. There are item blocks on the sidewalks, and the fence protects players from projectiles thrown by the other racers, such as Red Shells; they can also avoid the traffic on the main road using this route. After curving past the hills, there is a short straightaway; the sidewalk empties back into the road, and the racers all pass through a row of three item blocks before entering the second tunnel of the track. The tunnel curves around to the left, opening up on a straightaway leading to the bridge that gives the course its name. Halfway along the bridge are three more item blocks. There are two more item blocks on the tops of the bridge's beams, which are also inlaid with Dash Panels, meaning players who attempt to cross the bridge that way run the risk of losing control and falling off (either onto the track below, which wastes time, or into the water which means they need to be rescued by Lakitu, which takes even longer). While riding on the top of the arches of the bridge, it is impossible to get hit by Spiny Shells. After the bridge is the finish line and the start of the next lap. The track has almost the same shape as Mario Circuit 1. The course also features vehicles which only appear on the main roads, and do not take any of the shortcuts. The course features regular cars, buses and cargo trucks, as well as Mushroom Cars which drop Mushrooms when hit and Bob-omb Cars which explode upon impact. Moving Item Boxes also appear throughout the course. The vehicles that appear on the stage in Mario Kart: Double Dash!! vary based on the mode the player selects. If the player selects Time Trial mode, there will be a Wiggler Wagon with twenty wheels (the Wiggler Wagon is always on the right lane), three Star Travel buses (two on the right lane and one on the left lane), two Peach Beach buses (one on the right lane and one on the left lane), two Express trucks (all trucks are on the left lane), two Moo Moo Farm trucks, one yellow car (left lane), and seven red cars (three on the left lane and four on the right lane). No Mushroom Cars, Item Boxes, and Bob-omb Cars are present in Time Trials. 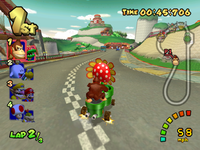 If the player selects Grand Prix mode for a single screen (single player or co-op play), there will be a Wiggler Wagon with twenty wheels (right lane), two Star Travel buses (one on the right lane and one on the left lane), three Peach Beach buses (two on the right lane and one on the left lane), two Express trucks (left lane), two Super Chocolate trucks, one yellow car (right lane), three blue cars, (one on the right lane and two on the left lane), four red cars (two on the left lane and two on the right lane), two Mushroom Cars (all Mushroom Cars are on the left lane), four Item Boxes (two on the right lane and two on the left lane), and three Bob-omb Cars (two on the right lane and one on the left lane). If the player selects a split-screen mode and items are also played, the amount of vehicles will be reduced. There will be a Wiggler Wagon with ten wheels (right lane), four Star Travel buses (two on the right lane and two on the left lane), one Moo Moo Farm truck (left lane), one Super Chocolate truck, one blue car (right lane), two red cars (left lane), one Mushroom Car (left lane), two Item Boxes (one on the right lane and one on the left lane), and two Bob-omb Cars (one on the right lane and one on the left lane). If the player selects a split-screen mode and items are not played, the amount of vehicles will still be reduced. There will be a Wiggler Wagon with ten wheels (right lane), three Star Travel buses (two on the right lane and one on the left lane, one Peach Beach bus (left lane), one Express truck (left lane), one Super Chocolate truck, one blue car (right lane), two red cars (left lane), one Mushroom Car (left lane), and two Bob-omb Cars (one on the right lane and one on the left lane). In Mario Kart DS, the course underwent considerable changes. It is simpler, shorter, and does not have as many obstacles as in Mario Kart: Double Dash!! Most of the alternate paths were removed, excluding the shortcut over the hills. This version of Mushroom Bridge now features vehicles from Shroom Ridge, buses, trucks, and cars. Due to the DS's limited 3D graphics capability, vehicles cannot be seen from a far distance as they can disappear when far enough from the player, unlike in Double Dash!! Mushroom City and Princess Peach's Castle were removed from the background. Both of the tunnels are now lit green on the left side and lit red on the right side, compared to the original version where the first tunnel is lit green and the second tunnel is lit red. Also, the second tunnel's turns make acute angles, as opposed to the second tunnel's turns in Double Dash!! which is a natural curve. The course was never available in Wi-Fi mode. Missions 5-5 and 7-Boss take place here. In 5-5, the player needs to finish one lap in the opposite direction within the time limit, and in 7-Boss, the player needs to reach the finish before Wiggler. Mushroom Bridge as it appears in Mario & Sonic at the Sochi 2014 Olympic Winter Games. Mushroom Bridge returns in Mario & Sonic at the Sochi 2014 Olympic Winter Games as the setting for the Groove Pipe Snowboard Dream Event as the game's equivalent to Mario Circuit as in the Dream Ski Cross event from Mario & Sonic at the Olympic Winter Games. Like the aforementioned event, the entire road is covered in snow and the course is mostly downhill with Warp Pipes and a cannon to take racers to the top of each island. Wiggler Wagons can be seen on roads that are inaccessible to the players and a single stationary Wiggler Wagon on the bridge serves as a small ramp for the racers. Unlike in Mario Kart: Double Dash!! and Mario Kart DS, the course now has a NSMB-esque aesthetic. Daisy snowboarding on the course. Like in Mario Kart: Double Dash! !, it is possible to ride up the bridge's beams which are still inlaid with Dash Panels, if done successfully without falling off a ramp will take them to Warp Pipes faster than if the lower route was taken, these Pipes still lead to the same destination as the Pipes below. Throughout the track there are also grind rails which can either lead to alternate pathways or help to boost the player's speed. European website: "You'll have to contend with rush hour traffic as well as your rivals on Mushroom Bridge and its surrounding streets. Dodge the buses and cars and keep and eye out for a shortcut on the right-hand side, but keep a Mushroom handy because you're gonna need it." Wario taunts while inside the first tunnel. The babies race past a large mushroom hut. A Wiggler Wagon appears on this track. The second shortcut, which involves riding on the bridge rails. An extra passage near the starting line, and Mushroom City can be seen near the pipe. Princess Peach's Castle can be seen before the first tunnel. The Wiggler Wagon is shorter in length during a multiplayer race. The track icon in Mario Kart: Double Dash!! features the vehicles going the opposite direction. In the course's icon in Mario Kart DS, the Cheep Cheep reads "Flesh" instead of "Fresh", an error also seen in the game's kiosk demo. Also, there are three "Flesh" trucks in the demo, and only one in the final version. There are subtle differences in the speed of the vehicles running in the course in Mario Kart: Double Dash!! It takes about two minutes for a vehicle to complete one lap around the track and each vehicle has a moving speed of approximately 15 miles per hour, as the vehicles move faster than a player's kart's backing-up speed, which is 14 miles per hour. When players follow them either by trailing them or leading them, the vehicles slightly move closer or get further from other vehicles they are behind, depending on the vehicle. The Wiggler Wagon (both the 10- and 20-wheel versions) is the slowest, followed by trucks, buses, cars, Mushroom Cars, moving Item Boxes, and Bob-omb Cars. If the game is left unpaused for more than an hour while the player still follows the vehicles, all the vehicles on the right lane will have eventually caught up to the Wiggler Wagon and all the vehicles on the left lane behind a truck will have caught up to the truck. One of the Express trucks in single-screen mode behind the Star Travel bus in the left lane has the equivalent speed of a bus, mainly because it drives in a near-straight line, as opposed to the rest, which wobble. The vehicles will make sudden subtle stops occasionally when behind a slower vehicle. Several vehicles in the game are programmed to yield to the moving Item Boxes and Bob-omb Cars coming out of the pipe shortcut. Others do not yield for them. If a player lines up all the cars using Stars on the left lane, only the Peach Beach bus on the left lane in single-screen mode (a Star Travel bus in split-screen mode) will stop for the Bob-omb Car on the left lane. If said vehicle passes the Finish Line, the Bob-omb Car on the left lane is forced to wait until there are no more vehicles before it can enter the left lane. This page was last edited on March 31, 2019, at 00:48.